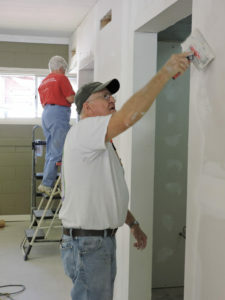 Twice each year RV’s roll into Dooly Campground and a team of NOMADS (Nomads On a Mission Active in Divine Service) works for three weeks on a variety of building projects. Their labor is free, and many of them learn on the job. 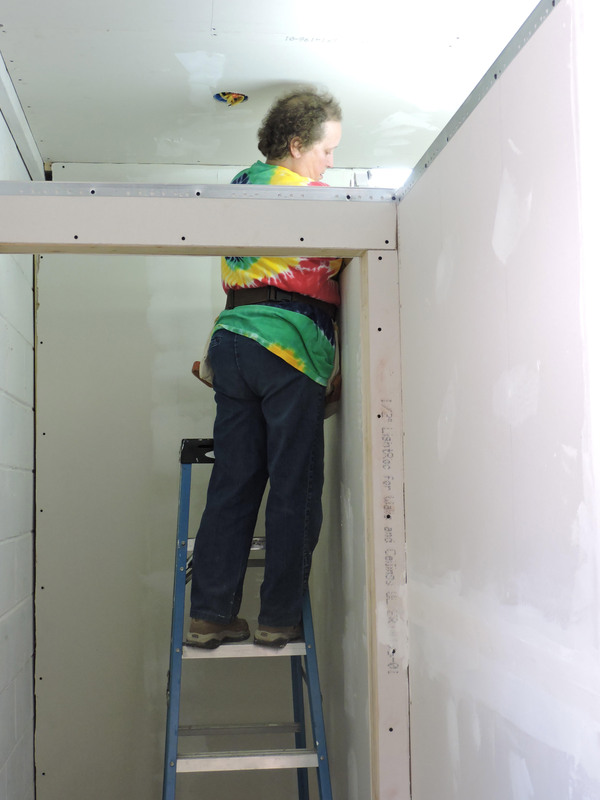 The latest team to visit has just completed the installation of dry wall to create several individual bathrooms in two dormitories that are used by campers. Previously, the bathrooms were communal with showers, sinks and toilets in one large room. 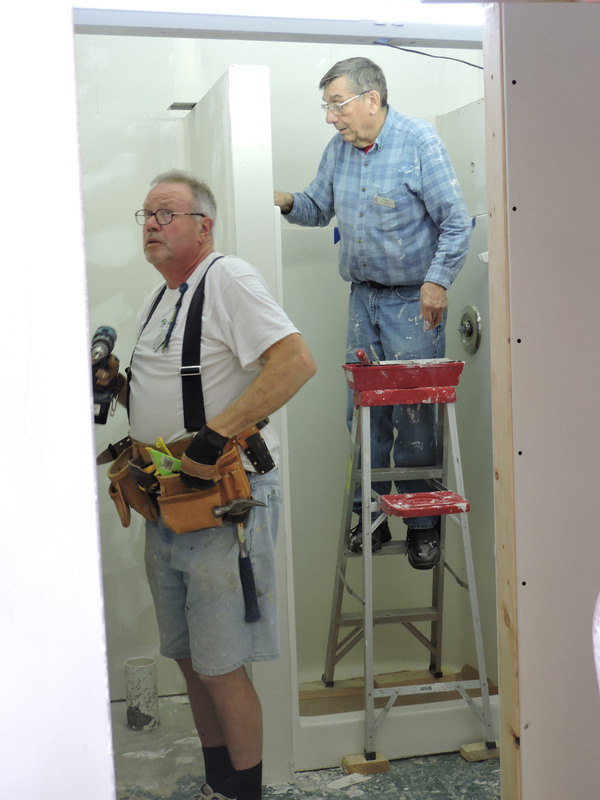 Jim Montstream and Bill Roberts install drywall in one of the bathrooms. Now, however, they will be more private, but no mirrors will be installed in these individual bathrooms, so hair drying, make-up application, etc. will have to be done in the larger sleeping quarters. Jim Bixler served as leader of the most recent NOMADS team to work at Dooly Campground. Here he and his wife, Chic are finishing up drywall work in one of the dormitories. Jim Bixler who led the team says he and his wife, Chic who have a home in Indiana joined the NOMADS in 2004. This is their first stop in Dooly County, but they have worked on more than 20 projects throughout the U. S. since they began. NOMADS started as a ministry of the United Methodist Church when several retirees got bored and asked their church if there wasn’t something more constructive they could do with their time. Now they are involved in new construction, remodeling and repairs for churches, children’s homes, camps, colleges, outreach missions and disaster rebuilding primarily in the southern U.S. during the winter months and other parts of the country the remainder of the year. “This gives us something useful to do in our retirement,” adds Bixler. As an added bonus, they get to see the country and make lots of friends. “It sure beats going to Florida and playing shuffleboard or cards all day,” says Bill Roberts whose home is in New York. 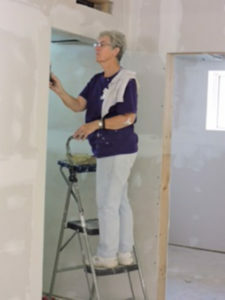 The seven-person team which also includes Jim and Barbara Montstream of Connecticut and Hank and Karen Cheney of Vermont worked on a job in Florida before coming to Dooly. When they left, they headed to Mississippi where they are helping to restore a historic black Methodist church that will be utilized as a neighborhood center for tutoring and other activities for young people. Karen Cheney and her husband, Hank traveled from Vermont to work at Dooly. Barbara Montstream says she really likes coming to Dooly. This is her second trip. While the projects on which NOMADS work are connected to the United Methodist Church, members from any faith are welcome to join. The main stipulation is that they have an RV and that they are at least 18 years of age. Anyone who is interested in joining the nationwide organization is encouraged to visit the website to learn more. That website also provides an opportunity for making donations to the 501(c)(3) group which means all gifts are tax deductible. More than 84% of the organization’s budget is spent in direct support of its projects.